Use this call to place a bid or a Best Offer on a listing, or to make a purchase. Note that this call cannot be used to purchase items that require immediate payment. Before devoting development time to production use of PlaceOffer, you must obtain approval by the eBay Partner Network. However, such approval isn't needed for use of PlaceOffer in the sandbox. PlaceOffer can be used in automated test scripts in the sandbox. Note: Before you can use PlaceOffer in production, you must apply for, and be granted, approval for using this call by the eBay Partner Network. Additionally, please review the PlaceOffer Policies and Guidelines. The policies are required for the use of PlaceOffer in the production environment. If you are granted access to PlaceOffer in production, follow the policies for your application. If you already have been granted access, and are unclear about the policies, please file a support ticket at http://developer.ebay.com/support/developersupport/request. In an auction listing with a Buy It Now option, PlaceOffer can be used to buy the item immediately, foregoing the bidding process. PlaceOffer can be used to buy items from basic fixed-price listings. In this case, the call is used to purchase one or more items at the price in the listing. Use PlaceOffer to purchase as many items as desired from the listing, up to the total number in the listing. A single call can be made that enables a user to buy multiple items from the same listing. Alternatively, PlaceOffer can be called multiple times on the same listing, with each call purchasing a subset of the total number of items desired. PlaceOffer can be used to make a Best Offer; for information about the Best Offer feature (including rules for counteroffers), see Enabling Best Offer. In the PlaceOffer request, specify an ItemID. Use the Action field to specify if you want to make a Bid or Purchase. For more information about the possible input values for PlaceOffer (including about functionality related to best offer), see PlaceOffer Input. For affiliate-related information specific to this call, see Earning Affiliate Commissions with PlaceOffer. Offer.Currency and the CurrencyID attribute on Offer.MaxBid are ignored for PlaceOffer. The currency that will be used in the order line item is the currency specified by the seller when adding the item. However, your users may want to see current conversion rates before placing an offer. To let them check currency conversion rates send them to the xe.com Universal Currency Converter provided by eBay. PlaceOffer is not compatible with eBay's Global Shipping Program prior to version 787. This means that when a buyer attempts to purchase an item that's listed with International Priority Shipping as an international shipping option and PlaceOffer is invoked, the buyer will receive an error message indicating that the item can be purchased only on one of the main eBay sites. You must upgrade your application to version 787 or higher of the Trading API schema before attempting to call PlaceOffer to let buyers purchase Global Shipping Program-enabled items. For more information about using the Global Shipping Program, see the Managing Shipping chapter of the Trading API User's Guide. Use of PlaceOffer in production is only granted to those that pass the affiliate vetting process. Apply for an eBay Partner Network account. Review the Help topics about becoming an eBay Partner Network member, and ensure that you read and agree to the EPN Network Agreement. Complete the Software Applications and Downloadable Tools web form. Please ensure that the information you provide is accurate, and be as thorough as possible when completing the form. Within 10 business days, the eBay Partner Network will respond, approving or declining your business model application. - Fill out the subject line with the following text: "PlaceOffer API Production Access (4-digit ePN code)"
- Check the box to "Accept Policy"
If you get eBay Partner Network approval, and then pass the eBay Developer Support review, then please reread the policies below that must be followed, and also reread the guidelines (which contain practices that you should follow). Use of PlaceOffer must be in accordance with the API License Agreement and the eBay User Agreement. If you are an eBay affiliate, you must agree to all terms and conditions specific to the eBay programs you join. The automatic and/or scheduled use of PlaceOffer is prohibited. An example is sniping, which is prohibited. For each PlaceOffer call made by your application, the user first must take an explicit action. That is, the application needs to get confirmation from the user before making each PlaceOffer call. The application shall not in any way, shape, or form collect the eBay username and password values of buyers or sellers that are involved in order line items. Users must enable bidding and buying through eBay's Authentication & Authorization mechanisms. The "Right Now On eBay" logo may be part of your application and Web UI. The plain eBay logo cannot be used in any part of the application and Web UI without written consent from eBay, Inc. For more information on logo policies, see API Logo Usage Requirements. To use PlaceOffer in the production environment, you must apply for, and be granted, approval by the eBay Partner Network. Additionally, your application must be functional in the sandbox environment. After you apply for approval by the eBay Partner Network, and if it is granted, then you must pass an application review by eBay Developer Support. The review process can take 10 business days or longer. In addition, before PlaceOffer access is granted in production, you must sign and return the eBay PlaceOffer API License Agreement Addendum. If you get eBay Partner Network approval, then to request eBay Developer Support review of your application you must file a technical support ticket, requesting PlaceOffer production access. If you are an eBay affiliate, you must specify your Campaign ID (from the eBay Partner Network) in the request, and submit your affiliate-tracking-enabled application for review. Please attach the signed PlaceOffer API License Agreement Addendum to the Developer Technical Support request when you submit your application for Production access. Note that if you are an eBay affiliate, your eBay Partner Network account may be temporarily suspended during the review process if your business practices and/or product functionalities are deemed questionable by eBay. Clearly label your application with the application name and the company name. Build information should be available through the Help. Use InvocationID to test if the PlaceOffer call succeeded. This is important if the application fails to get a response after making a call, due to network issues. If the same InvocationID is passed in after it has been passed in once on a call that succeeded, for a particular application and user, then an error is returned. For applications that offer status alerts for activities such as Outbid, please do not use GetItem for frequent item status checks. To check for status, use GetItemStatus in the Shopping API. For the best performance, use GetItemStatus to retrieve auction information. Your application should gradually increase polling frequency as the ending time approaches. Making three GetItemStatus API calls each minute during the last three minutes of an auction should be the maximum frequency. When passing in EndUserIP, use the client's external IP address (do NOT pass the private or LAN IP address). A BotBlock handle should be implemented wherever possible because eBay may ask users to respond to a CAPTCHA challenge from time to time. A BotBlock handle also can be treated as an error. To invoke a CAPTCHA challenge to test BotBlock, you can use GetChallengeToken. Affiliate-commission functionality is not available in the Sandbox environment. Affiliate commissions from PlaceOffer require that the call be made to the site on which the item is listed. Affiliate commissions from PlaceOffer also require that the affiliate has signed up with the eBay Partner Network for the site on which the item is listed. Sign up for an affiliate account at the eBay Partner Network, and declare "Downloadable Software" as your promotional method. If you have an existing eBay Partner Network account, log in and update your business information to reflect this promotional method on the Accounts tab. Download and fill out the eBay Partner Network Application Review form. Return the filled out form to Developer Relations and indicate "Place Offer API Request" in the subject line. The eBay Partner Network team will respond within 10 business days, approving or declining your request for the use of your application/software to earn affiliate commissions. Ensure that you read and follow the Network Agreement, Terms & Conditions, and Code of Conduct. Keep in mind that the use or distribution of an unapproved commission-generating application is a breach of the eBay Partner Network Agreement and may result in the termination of your affiliate account, as well as reversal of commissions. Capture the BotBlock container values (BotBlockUrl, BotBlockAudioUrl, and BotBlockToken) in the PlaceOffer response and input the respective value for BotBlockUrl or BotBlockAudioUrl in a new PlaceOffer call. Include a BotBlock container (with the user-input value and the token you captured from the BotBlockToken field). eBay then uses the values in your call to validate that the user is not a bot. You can use GetChallengeToken to test your application's ability to show that PlaceOffer is not being called by a bot. Make a GetChallengeToken request and capture ChallengeToken, ImageChallengeURL, and AudioChallengeURL. The application/user must input the value for ImageChallengeURL or AudioChallengeURL. Your application must capture this value and, in a PlaceOffer call, include the appropriate values. The BotBlock container should contain the user-input value along with the value from ChallengeToken (from the GetChallengeToken response). eBay then uses your BotBlock container to validate that the user not a bot. You can test PlaceOffer in the Sandbox. Testing the call requires at least two test users: one to list the item as the seller and the other to make the offer as a buyer. However, to accommodate all listing type use cases, your test bed should use three or more test users (which allows for more than one buyer). The test user acting as the seller must have sufficient seller qualifications to list all auction types to be tested. Test offers on all supported types of listings: Chinese, single-item fixed-price, and multi-item fixed-price. For multi-item fixed-price listings, make the offer for multiple items from the same listing (specified in the Offer.Quantity property). Use GetSellerList, GetSellerEvents, and GetItem to view changes to listings after placing offers. Test PlaceOffer under error conditions by deliberately specifying incorrect inputs. For example, specify an offer amount that is less than the current minimum bid amount. AffiliateTrackingDetails AffiliateTrackingDetailsType Optional Container for affiliate-related tags, which enable the tracking of user activity. If you include the AffiliateTrackingDetails container in your PlaceOffer call, then it is possible to receive affiliate commissions based on calls made by your application. (See the eBay Partner Network for information about commissions.) Please note that affiliate tracking is not available in the Sandbox environment, and that affiliate tracking is not available when you make a Best Offer. .AffiliateUserID string Conditional This field is not required, but an affiliate may want to use this identifier to better monitor marketing efforts. If you are using the eBay Partner Network, and you provide an AffiliateUserID, the tracking URL returned by eBay Partner Network will contain the AffiliateUserID, but it will be referred to as a "customid". .ApplicationDeviceType ApplicationDeviceTypeCodeType Conditional Note: If you are using affiliate tracking, this field is required. Type of device or platform from which the call originated. (in) This enumeration value indicates that the user's application is running in a browser. (in) Reserved for future use. (in) This enumeration value indicates that the user's application is a desktop application. (in) This enumeration value indicates that the user's application is running through a television set-top box. (in) This enumeration value indicates that the user's application is a wireless application. .TrackingID string Conditional Note: If you are using affiliate tracking, this field is required. The value you specify in this field is obtained from your tracking partner. For the eBay Partner Network, the TrackingID is the Campaign ID ("campid") provided by the eBay Partner Network. A Campaign ID is a 10-digit, unique number for associating traffic. A Campaign ID is valid across all programs to which you have been accepted. .TrackingPartnerCode string Conditional Note: If you are using affiliate tracking, this field is required. For information about the eBay Partner Network, see eBay Partner Network. BlockOnWarning boolean Optional If a warning message is generated when the call is made, this BlockOnWarning will block the bid/buy action if set to true. If BlockOnWarning is false or omitted, the bid/buy action is allowed, regardless of whether or not a warning message occurs. ItemID ItemIDType (string) Required Unique identifier that identifies the listing for which the action is being submitted. For a multiple-variation listing, you must also identify the specific variation within that listing using the VariationSpecifics container. Offer OfferType Required This container is used to specifies the type of offer being made for the listing specified in the ItemID field. The Offer.Action is used to set the action that is being taken on the listing. Offer.Action BidActionCodeType Required Indicates the type of offer being made on the specified listing. If the item is Best Offer-enabled and the buyer makes a Best Offer (or a counter offer), then after the PlaceOffer call, the buyer can get the status of the Best Offer (and of a possible seller-counter-offer, etc.) using the GetBestOffers call. See the eBay Features Guide for information about Best Offer-enabled listings and about GetBestOffers. Offer.BestOfferID BestOfferIDType (string) Conditional The unique identifier of a Best Offer on an item. This value must be specified as input to PlaceOffer if a buyer is performing any action against a Best Offer or Counter Offer. Offer.MaxBid AmountType (double) Required Amount of the offer placed. For auction listings, the amount bid on the item (subject to outbid by other buyers). For fixed-price listings, the fixed sale price at which the item is purchased. For auction listings with an active Buy It Now option, this amount will be either the Buy It Now price for purchase or the amount of a bid, depending on the offer type (as specified in Action). For PlaceOffer, the CurrencyID attribute is ignored if provided. Regarding Value-Added Tax (VAT): Even if VAT applies, you do not need to add VAT to the MaxBid value. If VAT applies to the listing, the seller can specify a VAT percent value when they list the item. Offer.Message string Optional A message from the buyer to the seller. Applies if the buyer is using PlaceOffer to perform a Best Offer-related action (Best Offer, Counter Offer, etc.). Offer.Quantity int Required Specifies the quantity of items from the specified listing that the user tendering the offer intends to purchase, bid on, or make a Best Offer on. For auctions, the value is always 1 . For multiple-quantity listings, this value must be greater than zero but not exceeding the quantity available for sale in the listing. VariationSpecifics NameValueListArrayType Conditional This container is used to identify a specific variation within a multiple-variation listing identified by the ItemID value. This container is required when attempting to perform an action on a multiple-variation listing. .NameValueList.Name string Conditional Depending on the call and context, this value is either a name of an Item/Category/Variation Specific, or a Parts Compatibility name. BotBlock BotBlockRequestType Conditional This container is only used by the PlaceOffer call request if the previous PlaceOffer call resulted in a BotBlock container in the response. If the caller receives this container in the response, that caller must make another PlaceOffer call, this time, passing in the encrypted token and URL that is returned in the BotBlock container in the response. This safeguard lets eBay know that a real user is making a PlaceOffer call and not a bot. BotBlock.BotBlockToken string Conditional This string value is an encrypted token that eBay generates and returns in the BotBlock.BotBlockToken field of the PlaceOffer call response when eBay is requiring that the user supply an authentication token and URL in order for eBay to process the PlaceOffer call. As soon as a user gets a BotBlock container returned in the PlaceOffer call response, that user should grab the authentication token and the URL and then run another PlaceOffer call, but this time using the BotBlock container and passing in the authentication token and the URL values. BotBlock.BotBlockUserInput string Conditional This string value is a URL that eBay generates and returns in either the BotBlock.BotBlockUrl or BotBlock.BotBlockAudioUrl field (returned for site-impaired users) of the PlaceOffer call response when eBay is requiring that the user supply an authentication token and URL in order for eBay to process the PlaceOffer call. As soon as a user gets a BotBlock container returned in the PlaceOffer call response, that user should grab the authentication token and the URL and then run another PlaceOffer call, but this time using the BotBlock container and passing in the authentication token and the URL values. EndUserIP string Required The public IP address of the machine from which the request is sent. Your application captures that IP address and includes it in a call request. eBay evaluates requests for safety (also see the BotBlock container in the request and response of this call). InvocationID UUIDType (string) Optional A unique identifier for a particular call. If the same InvocationID is passed in after it has been passed in once on a call that succeeded for a particular application and user, then an error will be returned. The identifier can only contain digits from 0-9 and letters from A-F. The identifier must be 32 characters long. For example, 1FB02B2-9D27-3acb-ABA2-9D539C374228. BestOffer BestOfferType Conditionally Container consisting of the status for a Best Offer. This container is only returned if applicable based on the listing and the value set for Offer.Action field in the request. BestOffer.BestOfferID BestOfferIDType (string) Conditionally Unique identifier for a Best Offer. This identifier is created once a prospective buyer makes a Best Offer on an item. BestOffer.Status BestOfferStatusCodeType Conditionally The status of the Best Offer or counter offer. For PlaceOffer, the only applicable values are Accepted, AdminEnded, Declined, and Expired. (out) Depending on context, this value can indicate that the buyer's Best Offer was accepted by the seller, or that the seller's or buyer's counter offer was accepted by the other party. (out) This value indicates that the Best Offer was ended by an eBay administrator. (out) Depending on context, this value can indicate that the buyer's Best Offer was declined by the seller, or that the seller's or buyer's counter offer was declined by the other party. (out) Depending on context, this value can indicate that the buyer's Best Offer expired due to the passing of 48 hours with no seller response (accept, decline, counter offer), or that the seller's or buyer's counter offer expired due to the passing of 48 hours with no response from other party. OrderLineItemID string Conditionally OrderLineItemID is a unique identifier for an eBay order line item and is based upon the concatenation of ItemID and TransactionID, with a hyphen in between these two IDs. The OrderLineItemID field is only returned if the Offer.Action field is set to Purchase in the input and the purchase is successful. A Purchase action in PlaceOffer can be used for a fixed-price listing, or for an auction listing where the Buy It Now option is available. Max length: 50 (Note: ItemIDs and TransactionIDs are usually 9 to 12 digits.). SellingStatus SellingStatusType Always This container indicates the current bidding/purchase state of the order line item regarding the offer extended using PlaceOffer. The fields that are returned under this container will depend on the attempted action and the results of that action. .ConvertedCurrentPrice AmountType (double) Conditionally Converted value of the CurrentPrice in the currency of the site that returned this response. For active items, refresh the listing's data every 24 hours to pick up the current conversion rates. Only returned when the item's CurrentPrice on the listing site is in different currency than the currency of the host site for the user/application making the API call. ConvertedCurrentPrice is not returned for Classified listings (Classified listings are not available on all sites). [ attribute currencyID ] CurrencyCodeType Always Converted value of the CurrentPrice in the currency of the site that returned this response. For active items, refresh the listing's data every 24 hours to pick up the current conversion rates. Only returned when the item's CurrentPrice on the listing site is in different currency than the currency of the host site for the user/application making the API call. ConvertedCurrentPrice is not returned for Classified listings (Classified listings are not available on all sites). SellingStatus.CurrentPrice AmountType (double) Always The current price of the item in the original listing currency. [ attribute currencyID ] CurrencyCodeType Always The current price of the item in the original listing currency. SellingStatus.HighBidder UserType Conditionally For ended auction listings that have a winning bidder, this field is a container for the high bidder's user ID. For ended, single-item, fixed-price listings, this field is a container for the user ID of the purchaser. This field isn't returned for auctions with no bids, or for active fixed-price listings. .UserID UserIDType (string) Conditionally Unique eBay user ID for the user. When bidding on items, UserID is replaced with the value "a****b" where a and b are random characters from the UserID. For example, if the UserID = IBidALot, it might be displayed as, "I****A". Important: In this format, the anonymous bidder ID can change for each auction. For GetMyeBayBuying only, when bidding on items: UserID is replaced with the value "a****b" where a and b are random characters from the UserID. When bidding on items listed on the the Philippines site: UserID is replaced with the value "Bidder X" where X is a number indicating the order of that user's first bid. For example, if the user was the third bidder, UserID = Bidder 3. Note that in this Philippines site format, the anonymous bidder ID stays the same for a given auction, but is different for different auctions. For example, a bidder who is the third and then the seventh bidder in an auction will be listed for both bids as "Bidder 3". However, if that same bidder is the first bidder on a different auction, the bidder will be listed for that auction as "Bidder 1", not "Bidder 3". For GetMyeBayBuying only, when bidding on items listed on the UK and AU sites: UserID is replaced with the string "High Bidder". For PlaceOffer, see also SellingStatus.HighBidder. See Working with Anonymous User Information. SellingStatus.MinimumToBid AmountType (double) Conditionally Smallest amount the next bid on the item can be. Returns same value as Item.StartPrice (if no bids have yet been placed) or CurrentPrice plus BidIncrement (if at least one bid has been placed). Only applicable to auction listings. Returns null for fixed-price and Ad type listings. [ attribute currencyID ] CurrencyCodeType Always Smallest amount the next bid on the item can be. Returns same value as Item.StartPrice (if no bids have yet been placed) or CurrentPrice plus BidIncrement (if at least one bid has been placed). Only applicable to auction listings. Returns null for fixed-price and Ad type listings. SellingStatus.ReserveMet boolean Conditionally Indicates whether the reserve price has been met for the listing. Returns true if the reserve price was met or no reserve price was specified. .SuggestedBidValues SuggestedBidValueType Conditionally This container is only returned if the buyer is attempting to bid on an auction item. To bid on an auction item, the buyer sets the value of the Offer.Action field to Bid, and sets the maximum bid amount in the Offer.MaxBid field. repeatable: [0..*] The SuggestedBidValues container is only returned if the buyer is attempting to bid on an auction item. A BidValue field is returned for each incremental bid value (up to the dollar value specified in the Offer.MaxBid field in the request) that eBay will bid on behalf of the buyer each time that buyer is outbid for the auction item. How many BidValue fields that appear will depend on the current winning bid amount, the required bid increment, and the buyer's specified max bid amount. [ attribute currencyID ] CurrencyCodeType Always The SuggestedBidValues container is only returned if the buyer is attempting to bid on an auction item. A BidValue field is returned for each incremental bid value (up to the dollar value specified in the Offer.MaxBid field in the request) that eBay will bid on behalf of the buyer each time that buyer is outbid for the auction item. How many BidValue fields that appear will depend on the current winning bid amount, the required bid increment, and the buyer's specified max bid amount. TransactionID string Conditionally Unique identifier for an eBay order line item. The TransactionID field is only returned if the Offer.Action field was set to Purchase in the input and the purchase was successful. A Purchase action in PlaceOffer can be used for a fixed-price listing, or for an auction listing where the Buy It Now option is available. Max length: 19 (Note: TransactionIDs are usually 9 to 12 digits.) . BotBlock BotBlockResponseType Conditionally This container is conditionally returned in the PlaceOffer call response if eBay wants to challenge the user making the call to ensure that the call is being made by a real user and not a bot. This container consist of an encrypted token, the URL of the image that should be displayed to the user, or the URL of an audio clip for sight-impaired users. After receiving this data in the response, the caller must make another PlaceOffer call, this time passing in the encrypted token and one of the URLs that was received in the previous call response. BotBlock.BotBlockAudioUrl string Conditionally This string value is a URL to an audio clip that eBay generates and returns in the PlaceOffer call response when eBay is requiring that the user supply an authentication token and URL in order for eBay to process the PlaceOffer call. As soon as a user gets a BotBlock container returned in the PlaceOffer call response, that user should grab the authentication token and this BotBlockAudioUrl and then run another PlaceOffer call, but this time using the BotBlock container and passing in the authentication token and this URL value in the BotBlockUserInput field. Note: This field will generally only be returned for site-impaired users. If this field is not returned, but the BotBlockUrl field is returned instead, the BotBlockUrl value should be passed into the BotBlockUserInput field of the subsequent PlaceOffer call instead. BotBlock.BotBlockToken string Conditionally This string value is an encrypted token that eBay generates and returns in the BotBlock.BotBlockToken field of the PlaceOffer call response when eBay is requiring that the user supply an authentication token and URL in order for eBay to process the PlaceOffer call. As soon as a user gets a BotBlock container returned in the PlaceOffer call response, that user should grab the authentication token and the URL and then run another PlaceOffer call, but this time using the BotBlock container and passing in the authentication token and the URL values. BotBlock.BotBlockUrl string Conditionally This string value is a URL to an image that eBay generates and returns in the PlaceOffer call response when eBay is requiring that the user supply an authentication token and URL in order for eBay to process the PlaceOffer call. As soon as a user gets a BotBlock container returned in the PlaceOffer call response, that user should grab the authentication token and this BotBlockUrl and then run another PlaceOffer call, but this time using the BotBlock container and passing in the authentication token and this URL value in the BotBlockUserInput field. For site-impaired users, the BotBlockAudioUrl field might be returned instead, in which case, the BotBlockAudioUrl value should be passed into theBotBlockUserInput field instead. DuplicateInvocationDetails DuplicateInvocationDetailsType Conditionally Information that explains a failure due to a duplicate InvocationID being passed in. .DuplicateInvocationID UUIDType (string) Conditionally This value represents the duplicate InvocationID or InvocationTrackingID that was used in the call request. .InvocationTrackingID string Conditionally This unique identifier identifies the business item the previous API invocation created. For example, the Item ID of the item created by an AddItem call. .Status InvocationStatusType Conditionally This enumeration value indicates the status of the previous call that used the InvocationID or InvocationTrackingID specified in the DuplicateInvocationID. Message string Conditionally Supplemental information from eBay, if applicable. May elaborate on errors (such as how a listing violates eBay policies) or provide useful hints that may help a seller increase sales. This data can accompany the call's normal data result set or a result set that contains only errors. Applications must recognize when the Message field is returned and provide a means to display the listing hints and error message explanations to the user. The string can return HTML, including TABLE, IMG, and HREF elements. In this case, an HTML-based application should be able to include the HTML as-is in the HTML page that displays the results. A non-HTML application would need to parse the HTML and convert the table elements and image references into UI elements particular to the programming language used. As usual for string data types, the HTML markup elements are escaped with character entity references (e.g.,<table><tr>...). See Standard Data for All Calls. Basic Call ↓ - Purchase a Chinese auction item with a Buy It Now option. Bids on a Chinese auction ↓ - Places a bid on a Chinese auction item. Purchases an Item Variation ↓ - Purchases one item from a listing with Item Variations. Purchase a Chinese auction item with a Buy It Now option. Bountiful Buyer has found a Harry Potter book she wants to buy. The book is listed as a Chinese auction with a Buy It Now option, so she can purchase the book with an Offer.Action of Purchase. Bountiful Buyer must know the Buy It Now price and item ID before calling PlaceOffer. Important: There a many rules and guidelines for using PlaceOffer, see Policies and Guidelines. The required input for this sample includes the ItemID for the book, the Action with a value of Purchase, the MaxBid of 20.0 (the Buy It Now price of the book), in the currency of the listing site, and the Quantity value of 1 to purchase the single book. The important information in the response is in SellingStatus. The SellingStatus.HighBidder.UserID indicates that Bountiful Buyer was successful in her purchase at the CurrentPrice of $20 US dollars. Places a bid on a Chinese auction item. Bountiful Buyer is very excited about the rare Harry Potter that she has found on eBay and wants to place a bid on the auction with the goal of purchasing the item. While the starting bid for the item is $1.00 US dollars, Bountiful Buyer has a feeling the volume is worth more than that. She places the first bid on the item, submitting the bid for $5.00 US dollars. The bid is successful, which can be gained from the fact that the CurrentPrice returns with a value of 1.0 (the currencyID is set to USD, indicating the price is in US dollars). Bountiful Buyer now has the leading bid for the item. Purchases one item from a listing with Item Variations. User bountifulbuyer has searched for and found a listing with women's Polo tops in several colors. The listing organized the tops by using Item Variations. She wants to buy two medium pink tops for $17.99 each and a medium black top for $20.00. As pink and black are different variations, she can't buy them at the same time. (She needs to use separate PlaceOffer requests.) In the sample below, she is purchasing the two pink tops only. The application needs to completely specify all the variation's VariationSpecifics in order to uniquely identify that variation within the specified listing. The important information in the response is TransactionID, which indicates that the purchase was recorded by eBay. She can use the value as input to GetItemTransactions to verify the amount paid (before shipping), the quantity purchased, and which variation she purchased. SuggestedBidValueType (added): Container for next bid suggestion values for auction items. SellingStatusType.SuggestedBidValues (added): Returns an array of suggested next bid values for an auction items. OrderLineItemID (modified): The OrderLineItemID value is now returned in Production if the Purchase action is used and the purchase of the item is successful. OrderLineItemID (added): A unique identifier for an eBay transaction, which is based upon the concatenation of ItemID and TransactionID with a hyphen in between these two IDs. OrderLineItemID is only returned if you set your request version to 705. (doc change) The documentation for getting approval to use PlaceOffer in production has been updated. SellingStatus.HighBidder (doc change): For multiple-quantity fixed-price listings, the high bidder is only returned if there is just one transaction. VariationSpecifics (added): Identifies a variation from a multi-variation listing. Required when you want to purchase items from a variation. BidActionCodeType (modified): Various Best-offer-related enums added to BidActionCodeType. Offer.Message (added): A message from the buyer to the seller. Applies if the buyer is using PlaceOffer to perform a best-offer-related action (best offer, counter-offer, etc.). Offer.BestOfferID (added): A buyer specifies this value to accept or decline a seller's counter-offer. 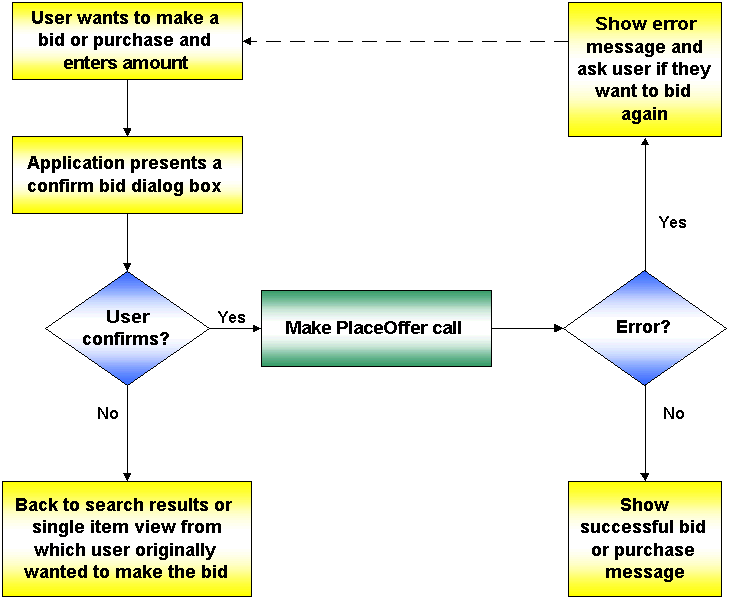 BestOffer container (added): For a best-offer-related action of a buyer using PlaceOffer, contains information about the best-offer-related action. TransactionID (added): The TransactionID field can be returned if, on input, you specified Purchase in the Action field. The TransactionID field contains the ID of the transaction created. This field applies to the following types of listings: FixedPriceItem and StoresFixedPrice. This field also applies to Chinese BIN if you specified Purchase on input. AffiliateTrackingDetails, PlaceOfferRequest.BotBlock, PlaceOfferResponse.BotBlock (added): These containers are for affiliate tracking and for handling a botblock challenge. EndUserIP (added): EndUserIP is used to specify the public IP address of the machine from which the request is sent. Additionally, in the Sandbox (test) environment, you can evaluate PlaceOffer.